You might well have noticed a change in the world relatively recently, that is, everyone now spends approx 23 hours a day glued to their phones. Nothing we can do about it of course, but how, you’ll no doubt be asking, does that affect wedding photography? Well, you’re in luck because I’m about to tell you. Hold on to your hats. See me, right? I’m no Luddite. I like a nice bit of technology, I embrace it and the positive change it can make to our lives. So, with the help of some Americans, I’ve made some changes to the way I help my lovely wedding clients see and share their photos. Because surely that’s the point – why have lovely wedding photos (lovely you say? Thank you. You’re too kind) and not show them to anyone? We wedding photographers have been doing online galleries in one form or another for years, but I’m now taking things one step further with a personal Wedding WebApp for my couples. This doesn’t replace the online gallery, but works in concert with it. I also ought to note that “my” couples also always get a USB stick of proper high resolution printable images, and about 50% of them choose to have a real physical album too. Note the unique URL for their wedding. Nice, eh? What you see there is a set of highlights or favourite pictures from their wedding. At the bottom you’ll note the link to go to the complete gallery, which remains password protected – so you can choose who sees your photos. I build these in advance of the big day for “my” couples. They go onto my Clients page on the website, and of course I give the link to the lovely people in question too. One of the questions I’m most often asked at a wedding (apart from “Have you seen any fights at weddings?” (which I haven’t by the way, I only ever work for nice people)) is “How can I see the photos?” Working on the assumption that you’d like your family and friends to see your photos, I put a signup form into the WebApp so that people can go and enter their email address, and I can let them know when the photos are online for them to look at. So, before there are any photos to see in it, it’s already working for you. The mailing list the email addresses go into is specific to each wedding, so there’s no chance of sending the wrong details out, and I also promise not to spam anyone or sell their details to PPI reclaim companies or double glazing salesmen. I’ve also put a useful map of the wedding venue’s location in there. So that’s nice. And anyone who downloads or bookmarks the App in advance of the wedding will see it automatically update with the photos once they’re up. So that’s nice too. The WebApp is designed to be properly responsive too, that is to say it displays perfectly on smartphones and tablets as well as on a computer. But there’s more functionality baked into it – you can save it to your phone or ipad etc, just like a “normal” app but without going via the Apple App Store or Google Play on Android devices. Once that’s done, it’ll even work when you have no internet connection – so you’ve always got some of your lovely (thanks!) wedding photos in your pocket for when you want to show your friend, auntie or boss, or just want to relive the day in your mind’s eye. You can easily share from it too, either individual photos or the whole app, via all the normal methods e.g. Facebook, Twitter, text message, email, carrier pigeon (at a push, might require two or more pigeons to carry the phone between them). And there you have it. A unique (I’d say bespoke, but it’s a horribly overused word) Wedding WebApp available for my couples, for you to show and share with your friends and family on your phone, just like you do with everything else in the whole world, all the time. So that’s, as you’ll note I’m fond of saying, nice. What do you think? I’d love to have your comments, questions or suggestions. Could it go even further? Please do let me know by commenting below. 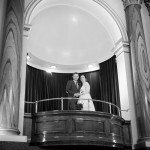 Wedding Photography at Cutlers Hall, Sheffield – a preview! Portrait photography in the High Peak – update of an old photo! →← New Tim Hensel Photography website coming soon!